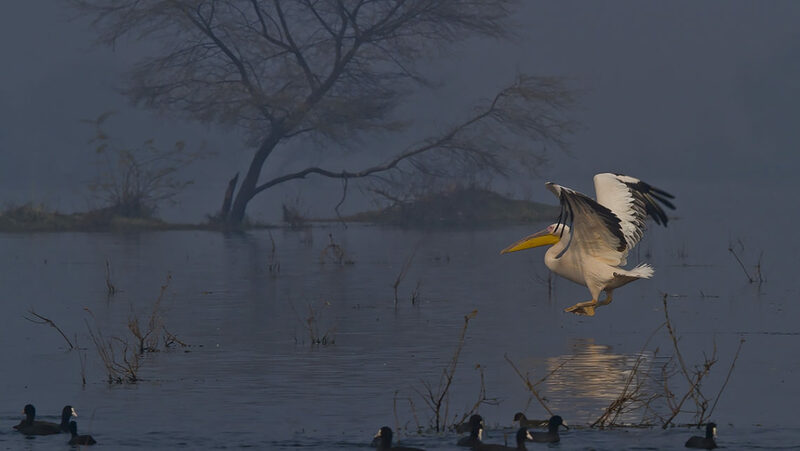 In the winter months of January and February, Bharatpur bird sanctuary is always special. Water from Chambal river fill up the plains here creating a marshy heaven for various species. Fish, insects, grass, and waterfowl are abundant. With them come some larger birds that are higher up the food chain like cranes, storks, eagles, and pelicans. This is my favorite location in this Keoladeo sanctuary, where in the morning the light falls straight on the birds from the East, illuminating them. With the most and the fog, the low angle winter light many times the light is very soft and diffused. During this capture, I followed this pelican who glided over water, reached on one side enough and then took off. I really enjoy the contrast here, as the water in the background is darker in the shade while the bird is softly little with a gentle winter light. Presence of coots below and acacia tree in the back adds a context. I photographed this handheld with my Canon 7D, and 100-400 mm lens, IS on, the polarizer on and at 400 mm with 400 iso, camera in aperture mode to obtain 1/1000 shutter speed at f5.6. With dark lake behind I did an exposure compensation of -1 while using the matrix or evaluative metering mode. I made sure that the AI service autofocus was on and the drive was set to high speed continuous. Learn more onfield tips and enjoy photographing with me and my team @impressions_photography in February this year.